Nickel, Gold Bullion and acrylic merge in this petite bench with enormous style. 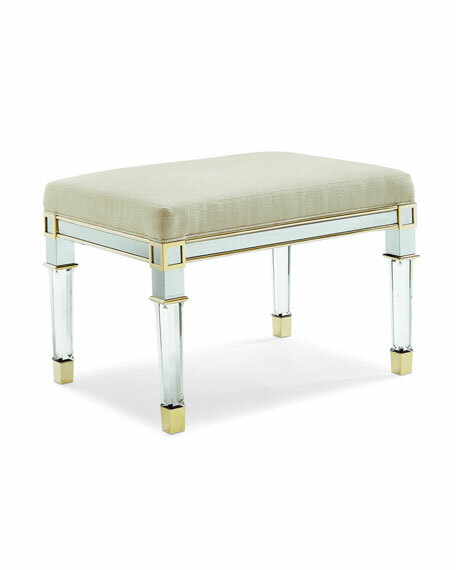 The bench frame and tops of the Italian square tapered legs are finished in polished nickel framed in Gold Bullion. The middle of each leg is faceted acrylic that is finished with a Gold Bullion metal ferrule. The rectangular bench seat is tastefully upholstered in a light grey strié fabric. Approximately 27.5"W x 20.3"D x 19"T.